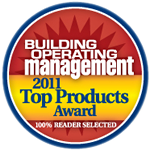 The SMART-Space™ Controller has won a 2011 Top Product Award from Building Operating Management (BOM) magazine. The Building Operating Management Top Products Awards are 100% reader-selected, in that a possible pool of winners is determined by actual reader interest, and then voted on by industry executives. Out of 500 possible products, the SMART-Space™ Controller was clearly one of the people's favorites and the choice of industry executives. The SMART-Space™ Controller will be featured in the January issue of Building Operating Management as a Top Products Award Winner.